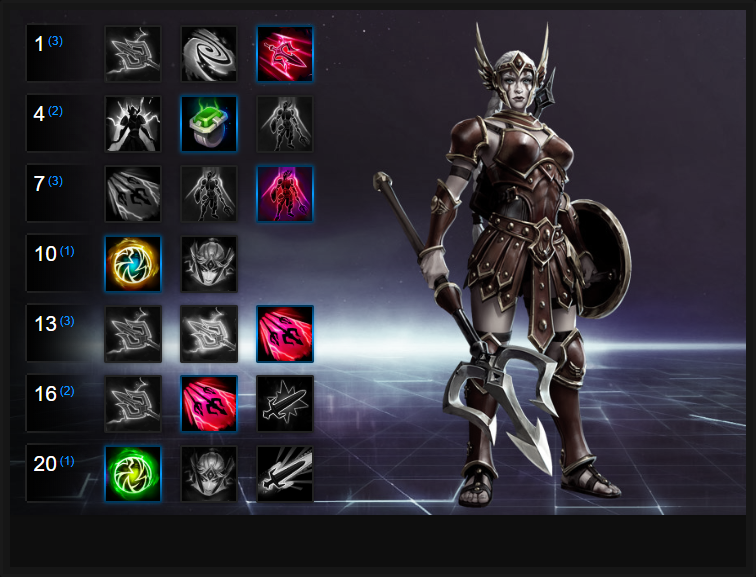 In this Cassia Build Guide, we provide an overview of her strengths, abilities, talents and matchups. Cassia is a ranged assassin that, by design, hard counters other assassins who rely on basic attacks. Her trait, Avoidance (see below) provides significant mitigation against such attacks, while her kit builds on this to further punish her pears. Her ability to blind, boost her damage from all sources of blind while having a gap-closer in Fend allows her to not only further increase her survivability but also bolster her damage. What holds Cassia back - despite her strengths over heroes such as Valla or Illidan - is the fact that she needs to remain active to be at her best. This places her at a huge disadvantage against any heroes who can slow, root or stun. When she isn't moving, her trait remains inactive and this sees her defences against basic attacks plummet by 65%. Worst of all, if your stutter-stepping isn't on point, she can prove a liability for her team. Finally, if Cassia can coordinate at draft with heroes such as Li Li, Johanna or Artanis - all of which cause Blind - she'll happily benefit from the constant damage boost. Avoidance - Fundamental to Cassia's play is her trait, Avoidance. Active at all times when she isn't mounted, it increases her basic armor by 65% when she's moving. Not only does this reduce basic attack damage against her by 65% but pretty much ensures she can 1 on 1 any hero that's basic attack reliant. Raynor, Valla, even The Butcher, as long as Cassia is moving - or stutter stepping - she'll retain the damage reduction. Unsurprisingly it's imperative that you learn how to stutter-step. Lighting Fury (Q) - Lightning Fury is a medium range projectile attack that allows Casia to hurl her javalin forwards. On contact with the first enemy struck, it will split and cast two additional boths either side of the source. These additional bolts deal the same amount of damage and always fire away from the center. In a team fight and when players are grouped up (say, in Zarya's Graviton Surge) it's relatively easy way of maximizing its damage potential. If you can, it's also worth positioning yourself so that the additional bolts cleave into a minion wave to soften them up. Finally, remember that Lightning Fury is a very narrow skill-shot. Be sure to practice. Blinding Light (W) - The primary source of Cassia's damage (or a large part of it), Blinding Light allows her - after a brief delay - to blind all those in a small area. All those blinded will miss their basic attacks for 2 seconds and Cassia will gain 15% increased attack damage. This damage boost only applies to those who are blinded so the incentive is to use it when you can follow in with damage and importantly, when your other team members also use theirs. Fend (E) - Cassia's conal attack allows her to charge forwards a short distance to a targetted enemy unit. On arrival she'll deliver rapid attacks. Although it delivers 50% less damage to minion waves, it's still more than enough to significantly lower the health of a pack. Against heroes however, it deals huge damage and although you'll stop moving duration the animation, the damage is enough to make it worthwhile. As a point and click attack, just be sure that the person you're attacking won't move after you've dived, otherwise you'll be hitting thin air. Ideally you also want to ensure they're blind when you arrive for later talent synergy. Ball Lightning (Heroic) - As a targetted heroic ability, Ball Lightning is best used in enclosed spaces or when the enemy team are grouped up. When cast the ball of lightning will randomly bounce between enemies up to 6 times and deal damage to all those hit. The random nature of its bounce does mean that it lacks focus, but it's also good for pressuring a group and I've found, forces them to split up at the very least. I'd often recommend you pick up this heroic on Battlegrounds such as Towers of Doom or Infernal Shrines where close quarter fighting is unavoidable. Finally, be aware that Ball Lightning HAS to have a second target to bounce to otherwise it will fail after the first (this can include yourself). Valkyrie (Heroic) - Valkyrie allows Cassia to pull an enemy player out of position. Although the Valkyrie moves fairly slowly, its telegraph is large and once she hooks someone, they'll be brought straight to Cassia's feet. For spiking down an opponent it's amazingly powerful and if you can time it so you land a Blinding Light > Fend the moment they arrive next to you, few can survive it. I'd also recommended that you try to aim for someone on the back-line such as Lt. Morales or Jaina as the Valkyrie will skewer and bring forward the first player she comes into contact with, knocking any other heroes aside. Charged Strikes allows Cassia to activate a utility skill, providing her with a 20% boost to her basic attack damage for 8 seconds but also allows her attacks to bounce. In a group setting where players typically gather together, it can allow Casia to deal incredible damage. Variable: Thunderstroke builds on Cassia's Lightning Fury and as a quest talent, it has two stages. Hitting 20 enemies increases your Lightning Fury damage by 100 and hitting 40 grants it a second charge. Typically it takes me about 12 minutes to complete the quest and the poke and damage increase is significant. Cassia has no sustain and no real mobility (unless she can target an enemy). Ring of Leech allows her to heal herself for 25% of the damage she deals to blinded enemies. Whether you use your Blinding Light > Fend against a minion wave, or simply use your basic attacks against a player, it's some much needed sustain that allows you to snowball 1 on 1. Variable: Inner Light builds on your other variables and allows you to increase the radius of your blind by 25% (great for covering a full team) but also ensures you blind anyone who roots or stuns you. Surge of Light allows Cassia to trigger her Trait when she has received a certain amount of damage. Once she does, she'll detonate AOE damage around herself to all those near her. When she dives with Fend and in amongst the enemy team, this can be a huge amount of additional damage in a confined space. Variable: Impale allows Cassia to deal 60% more Fend damage against enemies below 50% health. If you also combine this with the damage bonus when an enemy player is blinded, that's a 65% damage increase in a large conal attack. It ensures she can melt players incredibly quickly. For its damage and zoning potential, Ball Lightning is a good pick right now. If you're 1 on 1 against a target the Ball Lightning will allow you to easily come out on top, while it can pressure any team that are fighting as a group as long as you drop it when they're all near each other. Variable: In a coordinated team and simply because it's amazingly powerful at pulling the back-line to the front, Valkyrie allows Cassia to pick an opponent with ease and if your team are waiting in the wings, the player pulled is more than likely to die. Valkyrie is also amazing at preventing players from escaping due to its fairly large range. Variable: Pairing with your level 1 and 16 variable talents, Thundergod's Vigor reduces the cooldown of Lightning Fury by 1 second for each Hero hit. When Lightning Fury can pierce and with 2 charges (once your quest is complete) you can constantly firing them out, without having to wait. Penetrate increases the damage of Fend by 3% for each consecutive hit. This also stacks with your blind damage bonus, so if you can blind first and then use Fend, it's a huge amount of near instant damage players can struggle to avoid (especially in confined spaces). Variable: If you've completed your variable talent quest at level 1 and picked up Thundergod's Vigor at 13, Pierce allows Cassia to become a serious threat. Allowing Lightning Fury to pass through heroes, but each hero it passes through triggers your blind cooldown reduction. Best of all, you have two charges of Lightning Fury to continually push your spear through players. Infinite Lightning allows Cassia's Ball Lightning to bounce indefinitely, while also lowering the cooldown of her heroic by 3 seconds every time it hits an enemy hero. 1 on 1 it's amazing if you stay near someone and in a team fight, it forces the enemy team to spread out or the Ball Lightning will continue to cause huge problems. Variable: Allowing Cassia to ignore armor with her basic attacks, Titan's Revenge also provides a much needed range increase of 2 units to her basics. This allows her to poke much easier, without neccesarily having to dive in with Fend. Great against front-line heroes. This list of tips and tricks are just a handful of things we think will help your Cassia play. We'll continue to add to the list as required and if you have any tips you'd like to share, let us know in the comments below and we'll place them here. 1. Remember that Lightning Fury explodes on contact with the first enemy it hits. Ideally you want to use it so that it can hit in the middle of a group of enemies, before it splits into two more additional bolts. 2. Lightning Fury has a long range and is your only "poke" outside of your basic attack (which has a short range). Try not to waste it. 3. Blinding Light has a brief cast time before it blinds the area. Take this into account when trying to hit a moving target. 4. The blind from Blinding Light only lasts 2 seconds. You want to be sure you're near enough to your target during this time to make use of the damage bonus Cassia gains. 5. If you can, try to time it so you cast Blinding Light > Fend. With the right timing, you'll immediately arrive at your target when the blind is active, giving you a full duration maximum damage Fend. Not only that, but you can then follow up with Lightning Fury/Valkyrie. 6. Remember that a key part of your damage and sustain (when talented) is to ensure you're always attacking blinded foes. If you do, you'll get your health back and you'll deal much higher damage. 7. Fend is a single target attack that, similarly to Varian's Colossus Smash (or Charge) will have her rush forwards. You cannot change your direction when you begin to attack but you can cancel early by moving. 8. Try to always hit a player with Fend immediately after your Blinding Light so they take maximum damage and you rapidly heal. 9. If you need sustain in lane, blind the minion wave and then use Fend on the first minion. You'll cleave the full group and heal massive amounts (from level 4 onwards). 10. Having Fend ready when someone is stunned or rooted is ideal as it allows you to quickly burst them down with no opportunity for them to move out the way. 11. Remember to activate Charged Strikes after Fend ends. It'll allow you to deal high basic damage while you chase opponents down. 12. Try to always use Valkyrie on a high value back-line target such as Malfurion or Lt. Morales. Just be sure to aim it a little ahead of a player as they move to take account of the flight path. 13. Always, always move as Cassia. You need the damage reduction against basic attacks to trade effectively.